Nadine Malouf, Nicole Shalhoub, and Stacey Yen in Intractable Woman. Photo by Julieta Cervantes. BOTTOM LINE: Stefano's detailed theatrical memo on Anna Politkovskaya opens a window through which to peek into the slain journalist's life and work. There has been a resurgence of “silenced women” narratives: the revival of Atwood’s The Handmaid's Tale, Christina Dalcher’s Vox, and of course, the speculation over Doctor Christine Blasey Ford’s testimony, which has proven that even when a woman is found "credible," it may not even matter. The tales we seek to tell are inspired by what is true, as is the case with Anna Politkovskaya, a journalist whose life was a long battle against an unjust state, and her death, a proof of the oppression against freedom of speech. Ann Politkovskaya’s life—how do you summarize this within the course of a play? The NYC-born Russian journalist and activist is best known for her work during the Second Chechen War, which gained her an international reputation while also making her an enemy of the Soviet government. She persisted, despite several attempts on her life: she was threatened numerous times over the 7 years she spent reporting from the war, she was poisoned in 2004 on her flight from Moscow to help resolve the Beslan school hostage crisis, and not two years later, in October 2006, she was assassinated in her apartment building. Anna Politkovskaya’s life is far from a simple tale. Reading extracts from Wikipedia, or even watching documentaries about her, doesn’t quite do it justice either. The urgency and vulnerability unique to theatre might well be the best way to evoke the sense of threat that Anna might have experienced. 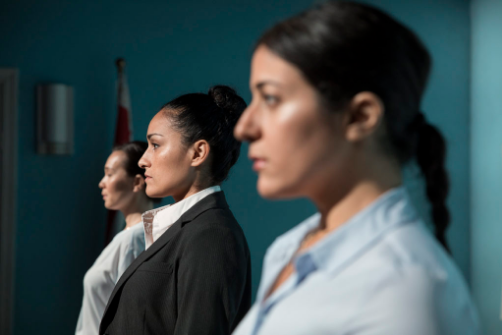 In Stefano Massini’s Intractable Woman, accurately dubbed a "theatrical memo," three actors (Nadine Malouf, Nichole Shalhoub, and Stacey Yan) become the chorus that both narrate Anna’s story and embody the assassinated journalist herself. Donning Politkovskaya’s signature white shirt and dark trousers, Malouf, Shalhoub, and Yan all have the tremendous gravitas and quiet force that make them the perfect candidates to carry out this poetic retelling of an all-too-complicated dossier. The word “intractable”—hard to control or deal with, and also (of a person) difficult and stubborn—perfectly describes both the subject as well as the narratives. The intractable woman, the difficult woman, prickly in the hands of politicians, in the hands of people who have something to hide—she is not loud, not hysterical, but rather, with a quite strength, she sheds light on what needs to be illuminated. With a clear, determined voice, she holds a beacon of truth so that evil cannot prevail. Within a space that resembles a press conference room in a government building, rows of straight-backed chairs face a single, empty podium, which is directly in front of the audience, so the three performers seem to be delivering a briefing for those of us who choose to listen. Director Lee Sunday Evans keeps her staging simple considering the dense text, allowing the three versatile performers to become vessels of this difficult story without being hindered by overly complex effects, aside from Masha Tsimring's occasional lighting shifts and Stowe Nelson's sound effects that transform the stark edges of the briefing room into various backdrops of Anna’s life, as when a shift in the chairs turns the room into a field hospital. The aesthetics are somber, almost relentlessly minimalist, yet in a deliberate and nuanced way. As a result, the spirit of Politkovskaya is present without elaborate props or scenic elements: we do not need a helicopter or machine guns to imagine the danger she was in. Massini’s words make an impact—not despite the simplicity, but thanks to it. Similarly, the physicality of the three performers sustains the kind of grace and strength that characterizes both Politkovskaya and her story. Intractable Woman is not entertainment, and is certainly not for everyone. It is not something you enjoy, but something you must absorb, willingly and wholeheartedly, to comprehend its importance and relevance. Like any memo, it is something you "receive," and in this case, Stefano Massini's theatrical memo, if at times difficult to digest, does reach its audience. I applaud director Evans' craft, the ensemble's charisma, and the effective design elements that make what could in lesser hands be an overly pedantic text into an engaging and dynamic production. Yet Intractable Woman is still a challenging piece to follow at times, because it covers the life of someone who lived in astounding volumes. The text deserves closer examination than might be possible in live performance, so I wish the program had provided more information on Politkovskaya's life, especially for those encountering her for the very first time. But the piece also evokes the famous Orwellian quote that “Journalism is printing what someone else does not want published; everything else is public relations.” In a world where news media are often misleading and fact-checking is becoming more afterthought than prerequisite, Politkovskaya’s tale is a necessity. And Intractable Woman is a challenging piece that will stay with you well beyond the 90 minutes under theatrical lights. Intractable Woman is by Stefano Massini. Translated by Paula Wing. Directed by Lee Sunday Evans. Set Design by Marsha Ginsberg. Costume Design by Junghyun Georgia Lee. Lighting Design by Masha Tsimring. Sound Design by Stowe Nelson. Production Stage Manager is Laura Smith. The cast is Nadine Malouf, Nicole Shalhoub, and Stacey Yen.